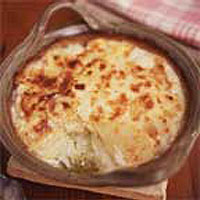 The definitive potato gratin, originally from the Alps, which has been adopted throughout France and lauded by the finest chefs, from Escoffier to Elizabeth David. Peel the potatoes and slice them wafer-thin. Rinse under cold water, then sprinkle with 1 tsp salt. Leave them in a colander for a few minutes. Meanwhile, put the crème fraîche in a pan large enough to hold all the potatoes. Add the bay leaf, and a little salt, pepper and nutmeg, and bring to the boil. Reduce the heat and simmer for 2-3 minutes. Add the drained potatoes to the pan and simmer gently for 5 minutes. Dip both halves of the garlic clove in salt and rub all over the inside of a 1-litre capacity, ovenproof gratin dish. Tip the potatoes and crème fraîche into the dish. They should be about 5cm deep. Smooth the top. Bake for about one hour, or until the potatoes are cooked through and the top is gorgeously crusty. Serve hot.